Renaissance Learning announced today the newest version of Accelerated Math—the most widely used math program in K12 schools. 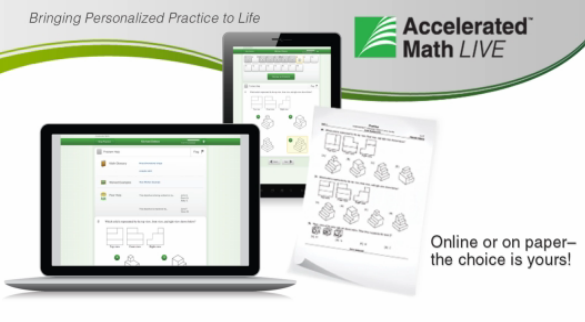 The new Accelerated Math Live will be available for the 2013-2014 school year. ﻿ At the heart of Accelerated Math Live is the Core Progress learning progression. New content has been built from the ground up specifically designed to meet the spirit and intent of the Common Core State Standards, with new content libraries from kindergarten through high school. Custom content also aligns to state standards, including the Texas Essential Knowledge and Skills (TEKS) test. With Accelerated Math Live's new online program, students can view and answer math problems using computers, laptops, or touch-screen tablets—or use paper and pencil. Working online, students' work is scored instantly, and teachers can monitor progress and guide instruction more quickly than ever. According to Jack Lynch , CEO of Renaissance Learning, Accelerated Math Live is a quantum leap forward in tailoring instruction for the common core. "With the rapid adoption of mobile technology in schools, Accelerated Math Live helps educators get more value from that investment. Students will become more self-directed with Accelerated Math Live's instructional resources at their fingertips—worked examples, related math glossary terms, and other tools linked to the problems they are working. Teachers will have more options to teach in an interactive, engaging classroom environment—peer-assisted learning, think-alouds, small group discussions, one-on-one instruction—even a flipped classroom. With Accelerated Math Live, teachers can easily tailor their instruction to the personal needs of each student. They'll have more options than ever to help propel students to college and career readiness." From the earliest days of the Common Core State Standards Initiative, Renaissance Learning has worked closely with leaders in the movement to strongly align its assessment and practice tools with the CCSS. "Accelerated Math Live is the culmination of years of study, rigorous development and empirical validation. The new Accelerated Math libraries and Core Progress learning progression represent an enormous step forward based on best practices in the industry," said Lynch. Renaissance Learning is a leading provider of technology-based school improvement and student assessment programs for K12 schools. Renaissance Learning's tools provide daily formative assessment and periodic progress-monitoring technology to enhance core curriculum, support differentiated instruction, and personalize practice in reading, writing and math. Renaissance Learning products help educators make the practice component of their existing curriculum more effective by providing tools to personalize practice and easily manage the daily activities for students of all levels. As a result, teachers using Renaissance Learning products accelerate learning, get more satisfaction from teaching, and help students achieve higher test scores on state and national tests. "In today’s news: A survey of education leaders revealed four key steps to making sure that online education programs are successful" reports Laura Devaney, Managing Editor. Progress monitoring tools and proper training in online teaching are critical factors in supporting and sustaining successful online education programs, according to a survey of school leaders. The survey, released by K12 Inc. and conducted by MDR’s EdNET Insight, included responses from superintendents, assistant superintendents, curriculum directors, principals, and special-education directors who are experienced in implementing online education programs. The 220-plus respondents identified and ranked a number of key success factors. Four factors were ranked by at least 80 percent of respondents as “extremely important” to the success of full-time online education programs, individual online courses, and credit recovery programs. Reporting tools/progress monitoring: These tools help teachers learn how students are understanding lessons. They monitor student performance and help educators understand if additional intervention is necessary. These tools can offer immediate and specific feedback to help educators personalize instruction for students. Availability of teachers to assist struggling students: Teacher assistance can help struggling students from becoming too frustrated or disengaged. This is important in fully-online and blended learning programs. Instructors who are well-trained in delivering online courses: Classroom teaching does not translate to online teaching, and educators must be specifically trained to teach online. These unique requirements include working with online curriculum, online collaboration, and other tools to help differentiate learning. Offering rigorous and engaging curriculum: An engaging curriculum helps students remain involved in their lessons, move forward, and focus on learning. Proper design ensures that different methods are available to deliver content to different learning styles. Download this Benchmark Study: Best Practices for Implementing Online Learning in K-12 Districts to learn how other educators are implementing successful online programs. Take a closer look at Rich Ling's New Book below. Why do we feel insulted or exasperated when our friends and family don’t answer their mobile phones? If the Internet has allowed us to broaden our social world into a virtual friend-net, the mobile phone is an instrument of a more intimate social sphere. 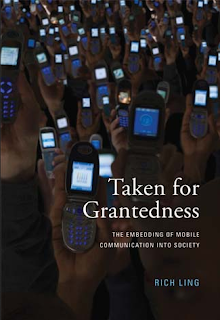 The mobile phone provides a taken-for-granted link to the people to whom we are closest; when we are without it, social and domestic disarray may result. In just a few years, the mobile phone has become central to the functioning of society. 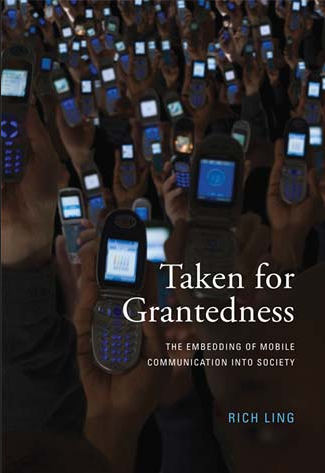 In this book, Rich Ling explores the process by which the mobile phone has become embedded in society, comparing it to earlier technologies that changed the character of our social interaction and, along the way, became taken for granted. Publication Date: October 26, 2012. Rich Ling is Professor at the IT University of Copenhagen, Senior Research Scientist at the Telenor Research Institute near Oslo, and Adjunct Professor at the University of Michigan. He is the author of New Tech, New Ties: How Mobile Communication Is Reshaping Social Cohesion (MIT Press, 2008). Tjek denne spændende artikel af Esben Schouboe og Rasmus Palludan. Esben og Rasmus skriver, "De smarte mobiltelefoner sender Emma Gads bud om etikette ud i kulden. Det betyder dog ikke, at vi er blevet mere kolde over for hinanden. Vi udvikler i stedet nye regler for høflighed, mener eksperter." Du kender manøvren. Din samtalepartner hiver sin smartphone op ad lommen og strækker armen helt ud, så skærmen er under bordhøjde. Selv om du ikke kan se den fedtede touchscreen, ved du udmærket godt, at vedkommende er ved at tjekke sin mail, skrive en sms eller endda spille et spil, fordi dit selskab er dømt kedeligere end de muligheder, den håndholdte tilbyder. Hamrende uhøfligt, ikke sandt? I den ene artikel, klumme, blog og hverdagssamtale efter den anden lyder samme konklusion: Smartphones gør os til nogle uhøflige teknologitosser. Tag for eksempel Thomas Skovs serie på DR »Høflighed på 100 dage«, hvor tredje afsnit handler om dårlige telefonmanerer. Eller New York Times, der i oktober skrev en artikel med titlen "Lad din smartphone overlevere de dårlige nyheder", hvor det bliver konkluderet, at mobilteknologien er ved at gøre os til "overfladiske mennesker med dårlige manerer". Richard Ling udgav for nylig bogen "Taken for Grantedness" ("Taget-for-givethed"), hvor han beskriver, hvordan mobiltelefonen er blevet så almindelig, at vi ikke længere taler om det som noget specielt, at vi kan få fat i hinanden, om vi så er på toilettet, på arbejde eller på den anden side af Jorden. Men når telefonen lyser op ved middagsbordet, har vi balladen. 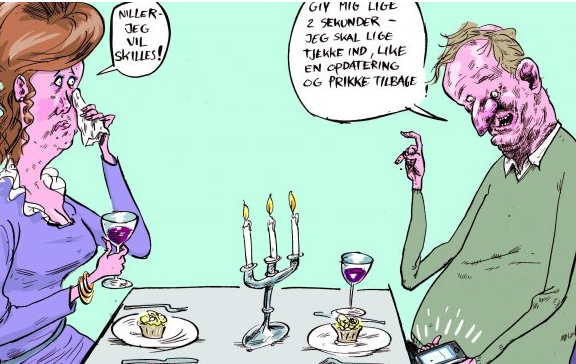 Problemet er, at vores sociale normer altid halter bagefter den teknologiske udvikling, forklarer Richard Ling. Siden mobiltelefonen kom til, har vi i fællesskab været ved at finde ud af, hvornår man må bruge den, og hvornår man ikke må. For omkring fem år siden blev billedet så yderligere kompliceret, da der kom en ny teknologi til: Smartphonen. "Nu er vi så ved at finde ud af, hvad reglerne skal være for alt det, vi kan, med det mobile internet," siger Richard Ling. "I dag er der en del, som føler sig stødt over brugen af smartphones, og så er der dem, som bare er ligeglade. Derfor er der brug for nogle faste rammer. Men jeg tror, at vi ender med at finde et kompromis, som alle kan leve med," siger Richard Ling. Telia har spurgt danskerne i en stor undersøgelse om, hvordan udnytter vi smartphones muligheder ud over at ringe og surfe nyheder? Og hvad med de sociale koder for brug af smartphones? Mette Honoré, kommunikationschef for Telia Mobility siger, "Mobiletelefonen med dens mange muligheder er efterhånden blevet en fast del af vores tilværelse i et omfang, som intet andet teknologisk produkt tidligere har været. Som kommunikationsmiddel, spillekonsol, medieafspiller og internetbrowser giver den os mulighed for at blive underholdt og udfolde os, som vi vil, uanset om vi er til middag med familien, til møder eller sågar befinder os på toilettet eller i dobbeltsengen. Det er fascinerende, men medfører også, at vi individuelt tager hensyn og ansvar i forhold til, hvordan og hvornår vi bruger vores smartphones". Bob Little summarizes, "Now in its fourth year, here – based on nothing more than experience and prejudice – are the new lists of the ‘Top Ten’ most influential people in the corporate e-learning sector, in the World, Europe, the UK and Asia-Pacific." Again, there has been increasingly keen debate among the judges as to who genuinely warrants a place on these ‘top tables’ of the great, good and seriously influential in online learning. Perhaps this indicates that, after some four years, these lists are being taken more seriously. Please bear in mind that these lists are compiled, from a corporate online learning perspective, on the basis of a person’s perceived current influence on the online learning industry – as a practitioner, commentator, facilitator and/or thought leader. It’s unlikely that readers will agree with all – or even any – of the judges’ decisions. However, these lists represent what a number of people think about the personalities who lead the corporate online learning world. Many thanks again to Bob Little for being named in the "Top Ten" most influential people in the corporate e-learning sector "Europe List".